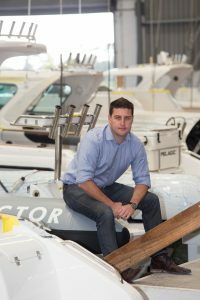 The achievements of the young CEO of New Zealand’s world renowned Rayglass Boats, Dave Larsen, have been acknowledged with his naming in the University of Auckland’s inaugural 40 Under 40 list. Dave Larsen joined Rayglass, manufacturer of both New Zealand’s leading luxury trailer boat brand and the internationally respected Protector range of RIBs, almost 20 years ago and admits he initially had to pester founder Tony Hembrow to get on board. “I always wanted to work at Rayglass but, when I met with Tony, he wasn’t able to offer me a job. “I kept sending him emails but didn’t receive a reply. In the end I just turned up one day with my toolbox and said I’d work for free until they felt I was worthy of being paid. Dave has been with Rayglass all his working life, starting as a young apprentice, then becoming Sales Director and, in 2013 at just 35, being appointed CEO. While a trade isn’t necessarily the traditional path to management, Dave believes his career path and achievements are proof that it’s still possible to start on the bottom rung and work one’s way up to the top of the ladder. In addition to their multi award winning Legend series of GRP powerboats, the company also manufactures the internationally renowned Protector range of patrol, work and pleasure RIBs and the highly innovative Pro Jet (the world’s first commercially manufactured PWC powered RIB).